It is hard to say exactly what the purpose of this particular machine is, but it is definitely worth speaking about. It is also hard to say what exactly its proper title would be, for sake of this entry, we will call it a freestanding cylinder arm. The first image is from Bega, although it is quite messy in the background it was the best picture for a sense of scale – you should see two, a white one and a green one. In the other two images you can begin to see that it is kind of like a combination of the bad robots in the Terminator, and the good robot Johnnie5. The motor sits on top of the whole apparatus and the belt connects to the head-pulley at the front of the machine (or at least as close to the actual needle bar as you can be). It has two pedals at the bottom, one for the drive, and one for possibly a stop mechanism, or maybe a thread cutting device. It is hard to imagine the second smaller pedal would be for reverse, or that there is reverse at all – as you can see from the diagram, it would probably not work in reverse, or if it did – it would be quite cumbersome and clumsy. 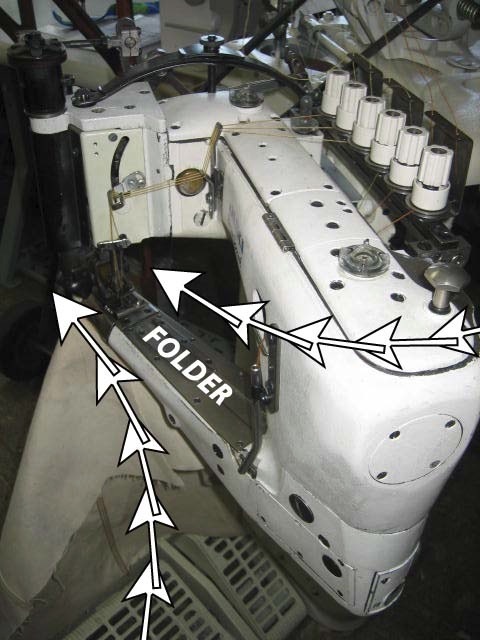 Not to mention that because these are probably always used with a folder, there would not be the possibility of moving the fabric back, you can see where the folder is mounted in the lower image. 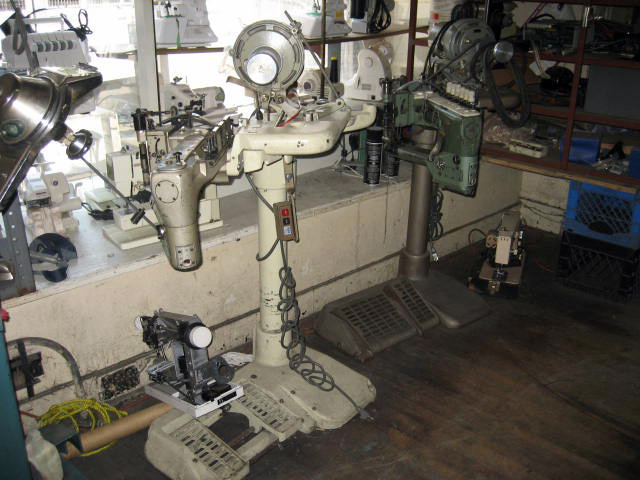 What is also unique about this machine is that it uses a chain stitch instead of a lock stitch. This is for one of two reasons, either it is due to tradition or it is because of how small the cylinder arm is underneath where the stitching occurs, therefor there is no room for a bobbin. Because the chain stitch can be fed like a serger (or overlock) machine, there is no need for a bobbin – not to mention that even if you were using a large bobbin case, you would have to replace it every few minutes of sewing time. This is why there are six thread tension knobs on top, one for each of the three stitch-seams, top and bottom. This particular one in the two lower pictures was set up to lay three stitches, three needles, 3 sets of threads. But once your set up with your material and have your thread routed and folder in place, you can go ahead and lay down some clean seams with ease. As you can see in the lower image, the material comes from both sides and meets up at the end of the cylinder arm. Why you cannot have the same action/result with a regular machine is a bit of a mystery. Although, what this machine allows you is not to have any struggle with your material fighting for space on the table between the needle bar and the structure of your machine to the immediate right. You could get an extended arm machine with an extra long bed, but this cylinder arm type machine allows your fabric to be completely free on both sides, which prevents unnecessary tugging and pulling of your fabric. When all is said and done, this machine is intended for the heaviest of industry people. 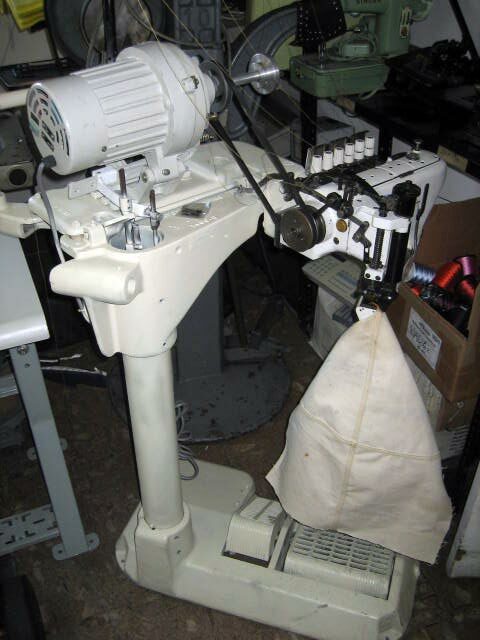 To have this in a home environment, or even a small company would be pretty luxurious, consider this a good example of the right tool for the job: but only once you have learned every other way of accomplishing the same types of stitch and seam combinations with more typical machines.